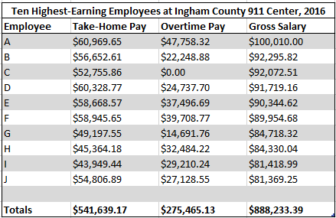 Earnings thresholds for Ingham County 911 center workers in 2016. Since Ingham County Controller Tim Dolehanty said in September that the county’s 911 dispatch center faces a staffing crisis, recruiting campaigns have yielded a handful of applicants and trainees. Dispatch center director Lance Langdon said the county is facing a problem that has begun to plague local governments across the nation. 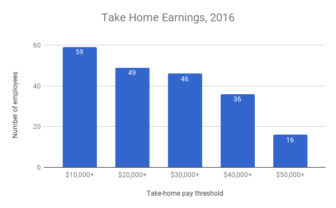 According to the center’s records, the top third of workers by salary make an average of $23,636.09 in overtime pay, a number that makes up nearly 40 percent of their average gross pay. This may speak to turnover at the center, but Langdon sees nothing wrong with the numbers. In total, the county paid more than $1 million in overtime during 2016. The top earners at the center can make more than managers. The top earner at the center made more than $100,000. Workers with the highest regular pay were at or near the top of the list for overtime as well, and of the total salary of the center’s top 10 earners, about 31 percent was overtime pay. The Ingham County 911 center’s 10 highest earners in the 2016 fiscal year. Seventy-eight people worked at the center in 2016, including those who did not work the entire year. Langdon’s desired total is 68 positions, and when the center was consolidated with parts of neighboring counties in 2012, Langdon noted that combined employment went down about 14 or 15 people. Since then, Langdon said, it has been short on managers. Langdon said he is still attempting to hire a staff services manager to work as a go-between for himself and hourly workers. He said the stress of job requirements for people who handle calls has been overblown. However, there are some natural stressors in the Ingham dispatch center, which has population bases in Lansing and East Lansing. Throughout 2016, 19 employees that did not work long enough to earn $10,000 in take-home pay. That’s almost a quarter of the 78 total people that worked there last year. Langdon said the turnover was about normal and that the issue goes beyond one county dispatch center. Ingham was recently passed by Oakland County to become the now-third most staffed center of its kind in the state, behind Oakland and Detroit’s Wayne County. Centers in smaller areas do not need as many hands on deck, which accounts for lower turnover among hourly workers. Whether an increase in staffing will end up solving the long-term deficit of available staffers is still up in the air. There are efforts to recruit throughout the county, but some have noted that the stigma surrounding a 911 center may be too much to handle. For now, Ingham will move forward with the trainees it has, and hope that they complete the six-month or year-long training courses to enter the center workforce. If not, Langdon will continue to get creative.